If you’re looking for garden decking ideas, this page has been created to provide useful information and suggestions. 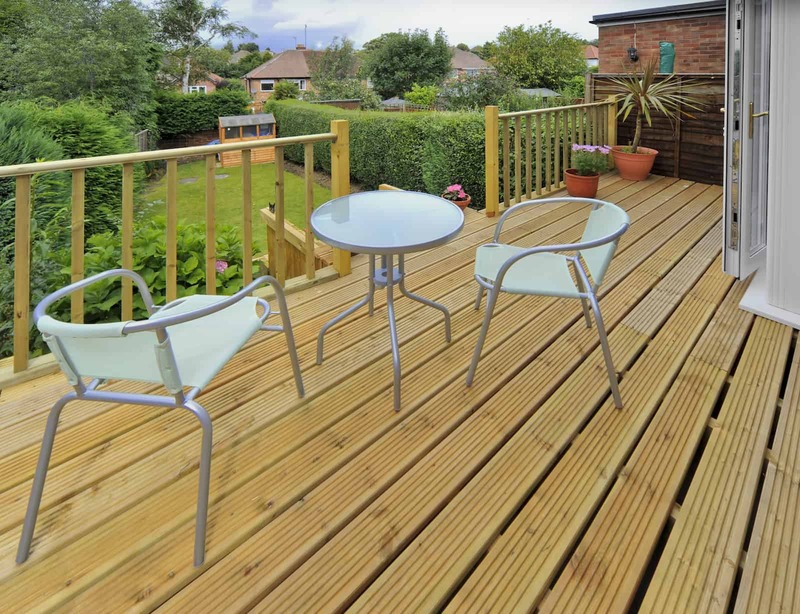 Acacia Gardens is a London decking company with the landscaping credentials to design and install your dream deck and maximise your outside space. To help clients decide which garden deck style to settle on we’ve collated our favourite photographs to give you inspiration. These garden decking ideas include information on how to choose the right decking by considering how you intend to use this space to the size and shape, materials, additional fittings and finished landscaping. Click on the tabs below to find out more. Before you make choices about the style and design of your decked area it is important to think about what you are going to use this space for. These uses will help determine which decking design is right for your requirements. Dining Area: If you want to entertain friends at the weekend and dine alfresco with your family during the week you should consider placing the decking near the house or patio doors. This will make it easier when you are bringing food from the kitchen. You will need to allow amply room to comfortably fit a garden table and enough chairs for your guests. An overhead canopy structure is recommended for hot days and an outside heater so you can enjoy this space all year round. Kid’s Play Area: If you want somewhere clean and safe for the children to play consider non slip materials and safety railings. Place the decking where you have a good view from the house. An overhead canopy is advisable for hot days. Decking sizes and shapes vary depending on your budget and design requirements. Small Gardens: If you have a small garden you may wish to deck the entire area which could include a built in barbecue and seating. Large Gardens: It would be costly and unattractive to fill a large garden with a deck so an entertainment area situated close to the house is ideal. If budget allows you could add a second spot where you can enjoy the evening sun. Shapes: The shape of your decking depends on the style of your house and garden. If you like contemporary design go for sharp angles. If your garden requires softening, you could go for a wavy or curvy shape instead. Decking materials range from softwood to hardwood and composite materials. Wood can be stained or painted and needs maintenance whereas composite materials need little maintenance, however some may think they look less appealing than natural wood. Softwood: This wood is from gymnosperm trees which are fast growing like pine or spruce. These are more environmentally friendly and often cheaper. Hardwood: From angiosperm trees which are slow growing like oak. These are slower to grow so more expensive and less environmentally friendly. However, you can ask for responsibly sourced timber. Composite: Made from recycled wood fibers and plastic, this type of material is hard wearing and cost effective. It comes in a range of colours. Planks and Tiles: Decking comes in either plank or tile format. These can be smooth or grooved and anti-slip formats are also available which is great when you have children, pets and seniors in the garden. There are many additional fittings for decking which include railings, steps, overhead structures and lighting. Balustrades: If you have a raised deck then you should consider railings and hand rails for safety. This is advisable if you have children. Steps: Raised decked areas may require steps which can also be made out of the same material for a cohesive look. Shade: You can incorporate an overhead pergola cover which you can grow vines on. Or perhaps you could incorporate a temporary cover like a sun shade or sun sail which can be removed if necessary. Lights: If you intend to use your garden and decked area at night you may wish to add lights to surround or step areas. It is important to consider landscaping which complements the decking. Planting: If you want to soften the decking, you can introduce planting close by such as flowers or shrubs. Alternatively, you could have your lawn side by side with the deck. Decking can often look bare so you might like to consider container or potted plants. Hard Materials: If you prefer a low maintenance garden you might to combine your decking with additional hard materials like paving or gravel. This can be interesting if you introduce shapes like curves to soften the appearance. You can incorporate a few hardy shrubs and plants for colour. Decking has many benefits for homeowners. It can turn a bland garden into a desirable dining spot which is just like having a new room but at a fraction of the price. If you incorporate a sunshade or an outdoor heater, your deck can be enjoyed all year round. This is an investment which will give you pleasure for many years. It can be used by the whole family and you’ll wonder how you ever managed before you had it installed. If you are interested in a having a new decked area in your garden, please call Acacia Gardens today on 020 8800 3866 or contact us here. We can help you make a choice on materials, design and style of your decking which will suit your budget. You can find inspiration for wooden fences on our Decking Pinterest Board which shows a selection of photographs gathered from the internet.